Findings highlight controversial nature of "Obamacare"
PRINCETON, NJ -- Americans see the 2010 Affordable Care Act as President Barack Obama's greatest achievement to date as well as his biggest failure, underscoring the controversial nature of the law that is likely to define his legacy. On balance, more Americans name the healthcare law as his biggest failure (36%) than as his greatest achievement (22%). History's verdict on Obama's presidency will not be rendered for years or decades, if even then, given the continuing revision of a president's legacy that inevitably takes place after his term ends. But after he has spent almost five years in office, Americans are certainly in a position to think about Obama's greatest achievements and biggest failures so far, and that is what Gallup asked them to do as part of its Dec. 5-8 survey. The Affordable Care Act, or Obamacare -- the bill Obama spearheaded and helped push into law in 2010 -- is the dominant policy or action that Americans volunteer in response to both questions. That significant proportions of Americans apparently can view the healthcare law as either a positive or a negative underscores its controversial status in recent domestic policy. This is not necessarily unusual. President George W. Bush's supporters clearly saw U.S. involvement in the Iraq war as a positive, while his detractors saw it as a negative. Similarly, some saw President Lyndon B. Johnson's Great Society programs as a great achievement, and others saw them as a major mistake. The two achievements that Americans mention most frequently other than Obamacare focus on Obama's ending the war in Iraq and bringing troops home, and capturing Osama bin Laden. Smaller percentages mention his stabilizing the economy and that he is the first black president. Twenty-three percent of Americans say "nothing" when asked about his greatest achievement, while another 10% don't give an answer. On the negative side of the ledger, in addition to Obamacare, Americans mention the president's inability to get along with Republicans and with Congress, his lack of communication, and his lack of leadership. Smaller percentages mention his failure to pass immigration legislation, his inability to bring all troops home from overseas, jobs issues, and the economy. Eight percent of Americans say Obama hasn't had a "biggest failure," while 7% don't give an answer. Not surprisingly, Americans who identify with or lean toward the Democratic Party are highly likely to cite Obamacare as the president's greatest achievement, while those who identify with or lean toward the GOP infrequently mention it, or anything else, as an achievement. In addition to Obamacare, Democrats praise Obama for bring the troops home, fighting terrorism/capturing bin Laden, and stabilizing the economy. 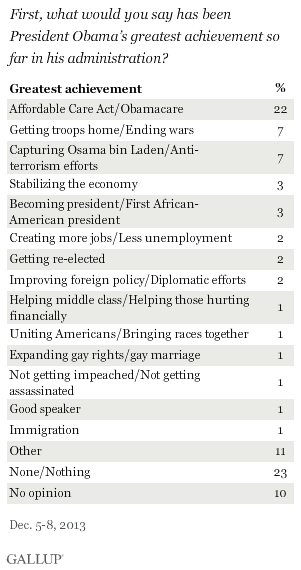 Almost half of Republicans say "nothing" or can't name anything they consider Obama's greatest achievement so far. Republicans who do mention an achievement cite anti-terrorism efforts and capturing bin Laden, and bringing troops home. Five percent of Republicans mention Obamacare as his greatest achievement. On the other hand, Republicans and Democrats alike are most likely to mention Obamacare as the president's biggest failure, although Republicans are twice as likely to do so. This suggests that even Democrats recognize the negative issues associated with the new healthcare law and its implementation. Republicans also cite Obama's lack of communication and lack of leadership as a failure, while Democrats mention his inability to get along with Congress and Republicans, his lack of communication, lack of immigration reform, lack of leadership, and his inability to bring all troops home. To this point in time, Americans' views of Obama's greatest achievement and biggest failure tend to revolve around the signature healthcare legislation that informally bears his name. This suggests that as Obama's term in office continues through its final three years and beyond, Americans' -- and most likely history's -- assessment of his presidency could turn on the ultimate verdict of how well his healthcare law achieved its goal of making healthcare affordable and accessible to all Americans. Results for this Gallup poll are based on telephone interviews conducted Dec. 5-8, 2013, on the Gallup Daily tracking survey, with a random sample of 1,031 adults, aged 18 and older, living in all 50 U.S. states and the District of Columbia. Americans' views of the healthcare law have stabilized, with approval now at about where it was in November, and disapproval is down slightly. Overall attitudes continue to tilt negatively, with 41% approving and 51% disapproving. In the U.S., a majority of Americans want Congress to either repeal or scale back the 2010 healthcare law. Republicans and Democrats are more divided about what Congress should do than they were in October.